Sharing what makes me happy. Hi there! I am going to completely surprise myself... two posts in one day? What?? Nevertheless, I had to post this because today is our 4th Wedding Anniversary! Some days it feels like 10 and some days like 2, but I wouldn't change a thing! Happy Anniversary babe! 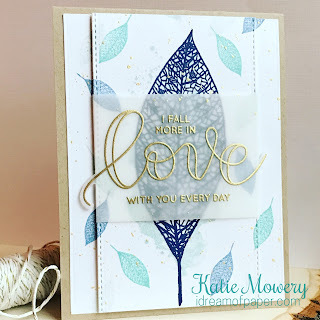 I decided to use the Lace Leaf stamp set by Concord and 9th. I've had it for a few months now and just hadn't found the perfect project for it...well this was it! Photos just don't do this set justice...its gorgeous! If you haven't gotten into layering stamps yet, this would be a great set to start with. The design is clean and simple, but very detailed at the same time! I used a variety of inks including Umbrella Crafts Robin Egg Blue, Lawn Fawn Mermaid, My Favorite Things Blue Yonder, and Ranger Archival Cobalt to stamp the back ground and main leaf image onto a 4.25" x 5.5" piece of Nina Solar White cardstock. I then die cut that piece for the background using a the tall stitched rectangle die from the Blueprints #23 set by My Favorite Things. I stamped the sentiment, which is from the Kristina's Love stamp set by Simon Says Stamp, onto a piece of Silhouette vellum using VersaMark ink and my MISTI. (Don't forget to use a powder tool!) This vellum is extremely durable and heavy weight so it really holds up to the heat when embossing. For the embossing, I used Ultra Fine Gold embossing powder, also from Simon Says Stamp. To make sure that my sentiment didn't get cut off, yet still wrapped nicely around the center piece, I fussy cut the tails of the "L" and the "E" using my craft nice and cutting mat. It adds just a little something extra to the sentiment, and I'm a sucker for details like that! Using foam tape, I raised the center and mounted onto an A2 size card base in Nina Desert Storm, then glued the two little side strips slightly underneath the center, yet still keeping the pattern lined up. As a final touch, I gave the background a speckling with watercolor splatters using No. 905 Light Gold from the Gansai Tambi Starry Colors set by Kuretake. This set is just magical! 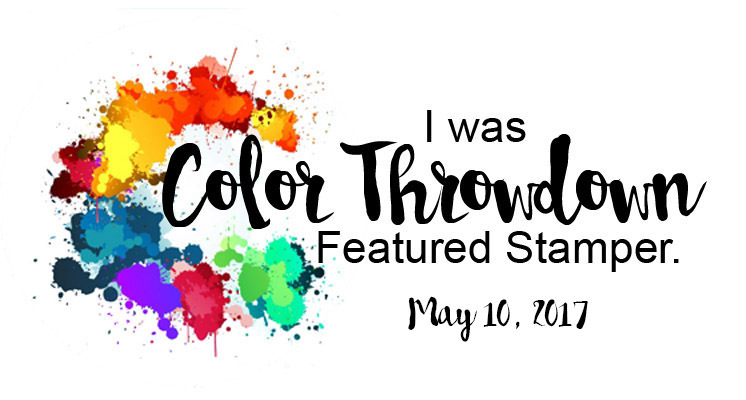 I hope you'll decide to give this a try and also play along with one of the challenges on the CAS(E) this sketch challenge blog! They would love to have you and you won't regret it! I am loving the colors that you use don this. I also like that you used different sized leaves. Really beautiful take on the sketch!! What a stunningly beautiful card! Happy Anniversary! 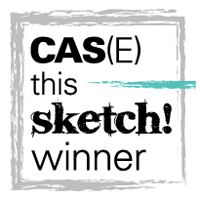 Thanks for joining us at CAS(E) This Sketch! Congratulations on your new blog journey and your win of CTS#210! 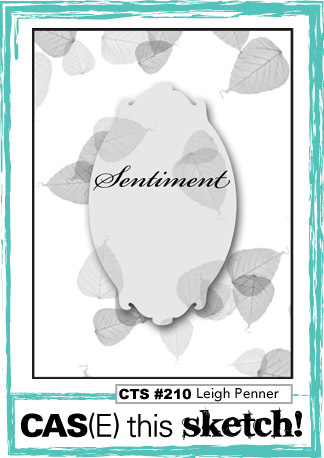 I love the combination of a bold big leaf and subtle little leaves & elegant sentiment heat-embossed on vellum! Oh my goodness! Thank you so very much! I am definitely learning A LOT! Hi! 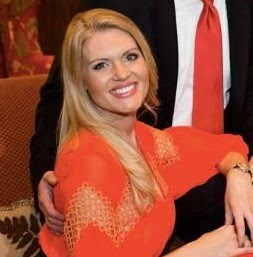 I'm Katie...Nice to meet you! I love to create and I hope you do too! I hope you find inspiration in what you see here, as I find so much inspiration from many of the talented artists and bloggers out there! I do ask that in return, you use what you've seen on this site for the benefit of those you love and not for monetary or notoriety gain. Also, if you are so inclined, I hope you give me some love in return! Links back to my posts/site are always welcome. Thank you kindly!